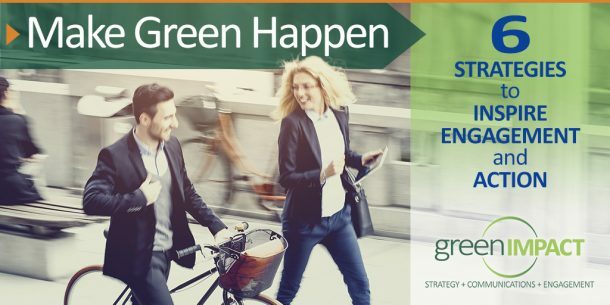 A complete, comprehensive engagement strategy that communicates to management, stakeholders, and green team leaders concrete strategies and resources for increasing the visibility and impact of your sustainability commitment and successes. ASSESSMENT: We start with a holistic assessment of your sustainability strategy and communications materials. We identify your strengths, weaknesses, and opportunities for improvement, based on best practices and industry trends. Our holistic approach looks both externally (how are you engaging your customers and stakeholders) as well as how you are engaging your employees. TARGET AUDIENCE & GOALS: Refine your goals and identify you target audiences and best channels/strategies for reaching them. MESSAGING: Propose values-based messaging and talking points to guide communications for the key internal and external audiences. VISUAL IDENTITY: Create a unique visual identity for your program, consistent with your core brand, to provide continuity, attract attention and steadily build awareness (optional task). BEST PRACTICES: Identify the specific best practices and strategies for improving the reach and impact of your program. ENGAGEMENT PLAN: Next we create a customized Engagement Plan with specific resources for improving the reach and impact of your program. 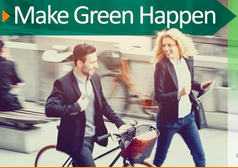 Resources can include, depending on your needs: roll out strategy, engagement activities, green champion stories, video, workshops, webinars, website content, and/or posters. PROGRAM MANAGEMENT: If needed, we can be your partner for implementation, working as an extension of your staff to manage the engagement plan. We can execute a year of activities, success stories, website content, collateral, workshops, and social media promotion. 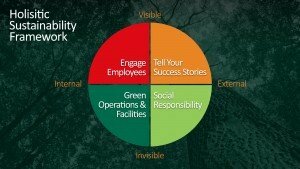 ENGAGEMENT WORKSHOP: This facilitated workshop will give your key team members resources, tools and inspiration to engage employees in sustainability. See the video above for highlights from on Make Green Happen Workshop. For more on the Engagement Workshop go HERE.